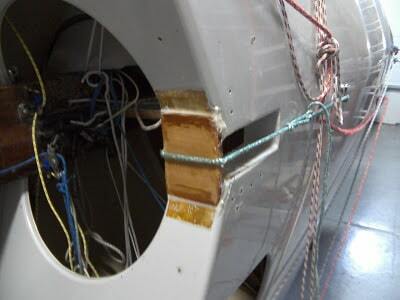 Some older Waterats, Hamlins, and Lindsays were built with a mast gate that does not allow for the amount of mast rake that is required by modern tuning grids. 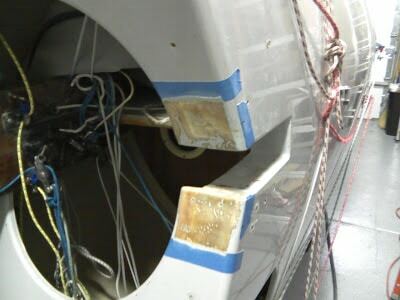 One solution to this is to move the mast base forward, but then you begin to stray from the tuning grid which typically calls for 10′-0″ from transom plane to aft face of the mast. Fit out 2 new booms for 7346 and 7611 – lots of sub projects here, wont begin until late April when the carbon sections arrive. As you can see we got a pretty good start on this stuff already. We will take pictures and post them here as we continue the work. Everything is pretty straight forward, but we hope our experiences can be of help to others. These are typical upgrades any older Waterat will need to bring it up to modern spec. The projects continued today. Prep work for the centerboard reinforcements is essentially complete. Those will be bonded in to the boat tomorrow. 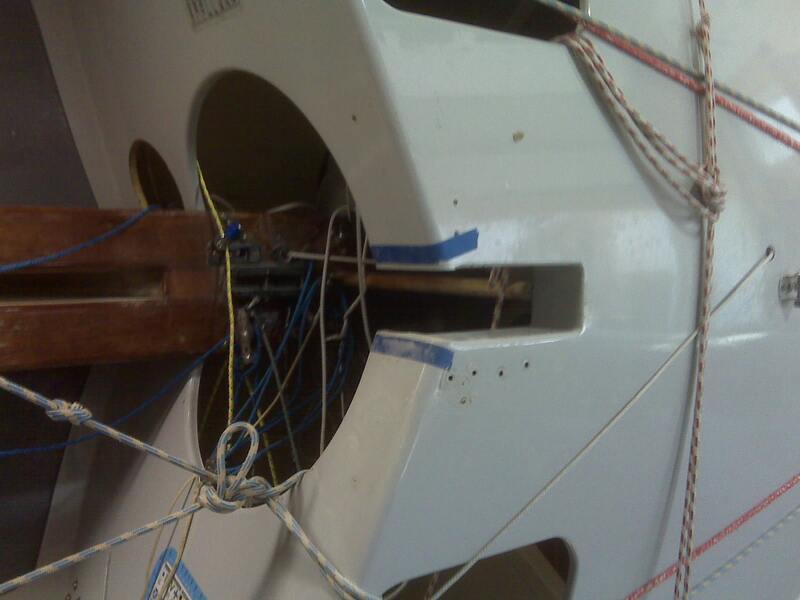 The back end of the mast gate was bonded into the boat today. Here is a photo sequence of what was done. 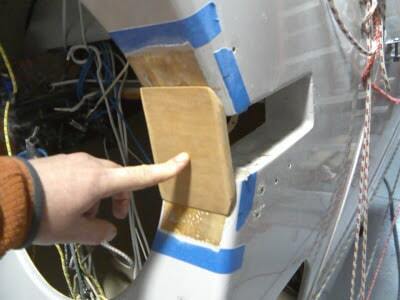 First the area was sanded down to the glass to create a good bonding surface. 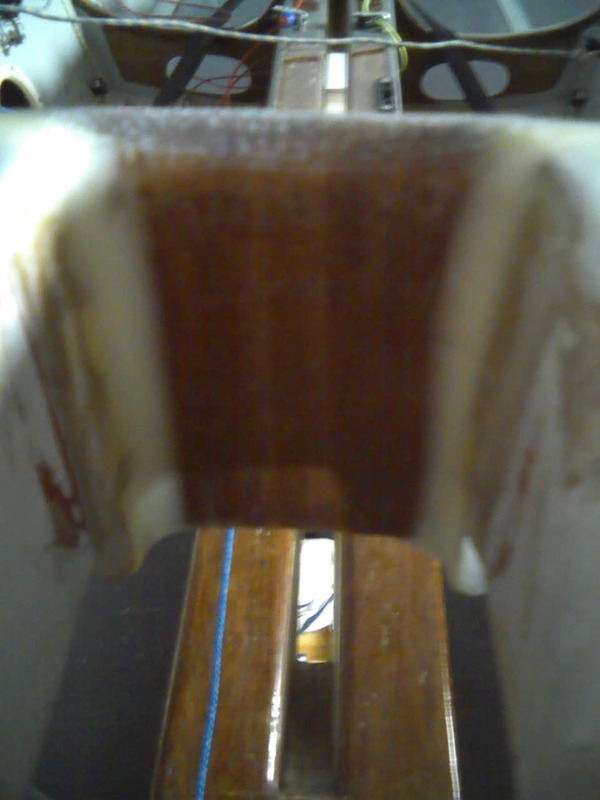 Next a piece of 1/2 inch mahogany was cut to fit the angles of the diagonal bulkheads. We made a cardboard template that fit so we could make the angles correct on the wood piece. The cuts were done on the table saw. The edges were rounded over at the router table with a 1/4″ radius round-over bit. The piece was then sanded and prepped for bonding. 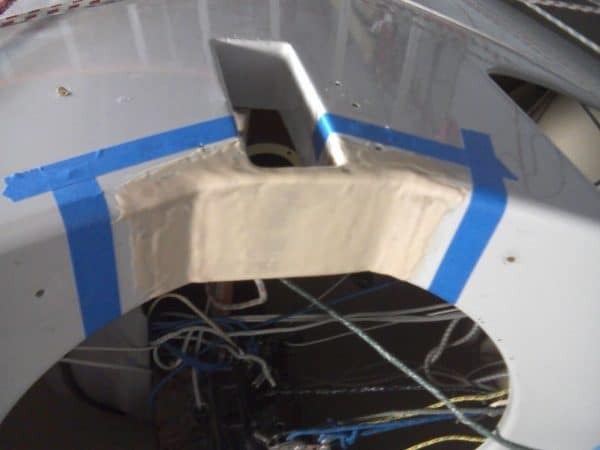 Next, we will glass over the fillets for strength, seal with 2 coats of West System 105/207, cosmetic fairing and spot painting with two-part polyurethane paint. More updates to come. 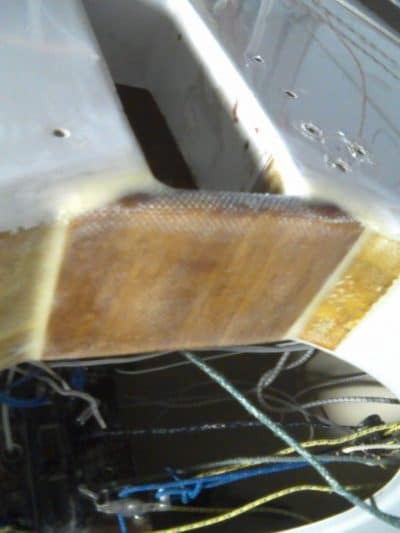 First light cosmetic fairing using West System 105/205 and 410 microlight fairing filler.